The Lawler 800 Parallel Manifold Recirculation System offers your customers either a redundant or high capacity designed system that is delivered in a pre-piped configuration for proper recirculation. This complete solution is a part of Lawler’s Power of OneTM pre-piped, pre-packaged, pre-tested systems, intended to give you and your customers one point of design and one point of accountability. Lawler Series 800 Manifold Parallel Recirculation Systems can be assembled using the 801, 802, 803, 804 or 805 master controllers. 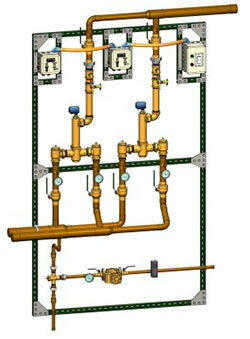 The Lawler Series 800 SEA Valve Basic Manifold Parallel Recirculation System offers your customers either a redundant or high capacity designed system that is delivered in a pre-piped configuration for proper recirculation. This Smart System for Smart Buildings gives your customers the peace of mind of one design, one system and one point of accountability. In addition, it provides your customer with the ability to monitor this system from a remote location via their Smart Building Management System. Lawler Series 800 SEA Valve Basic Manifold Parallel Recirculation Systems can be assembled using the 801, 802, 803, 804 or 805 master controllers. 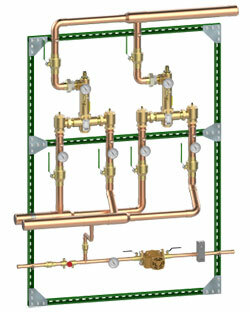 The Lawler Series 800 SEA Valve Deluxe Manifold Parallel Recirculation System offers your customers either a redundant or high capacity designed system that is delivered in a pre-piped configuration for proper recirculation. This Smart System for Smart Buildings gives your customers the peace of mind of one design, one system and one point of accountability. In addition, it provides your customer with the ability to monitor and adjust this system from a remote location via their Smart Building Management System. Lawler Series 800 SEA Valve Deluxe Manifold Parallel Recirculation Systems can be assembled using the 801, 802, 803, 804 or 805 master controllers.